I was so excited about this months Michaels Makers challenge! 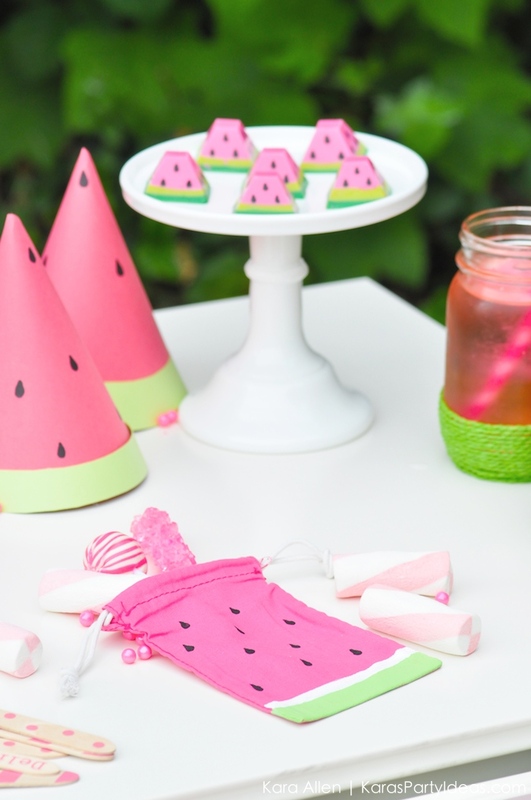 All the Michaels Makers were asked to create a summer party using fabulous items purchased from Michaels. 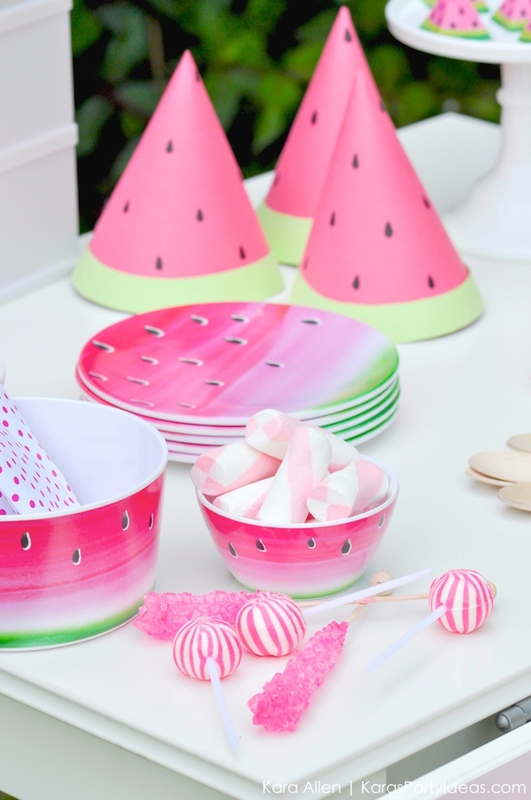 From paper crafts, party goods and baking supplies to new outdoor lighting, glass and floral, Michaels is the DIY destination for all of your summer celebrations. 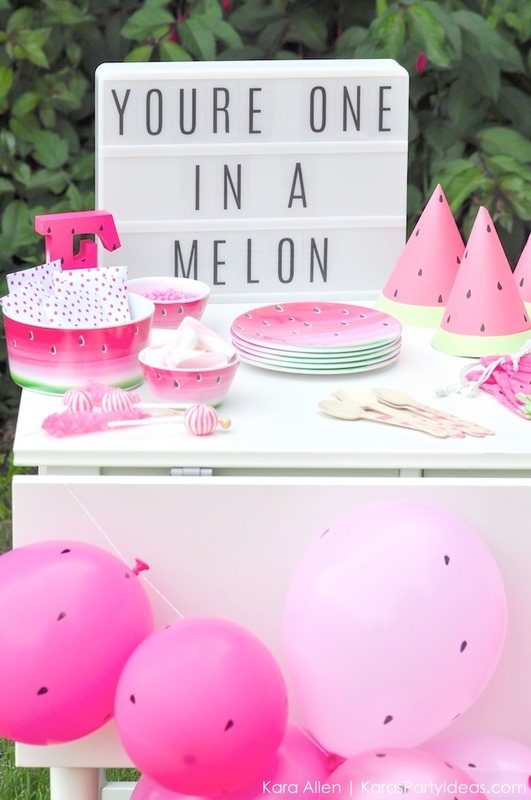 I decided to go with a SUMMER WATERMELON DIY BIRTHDAY PARTY and loved how it turned out! 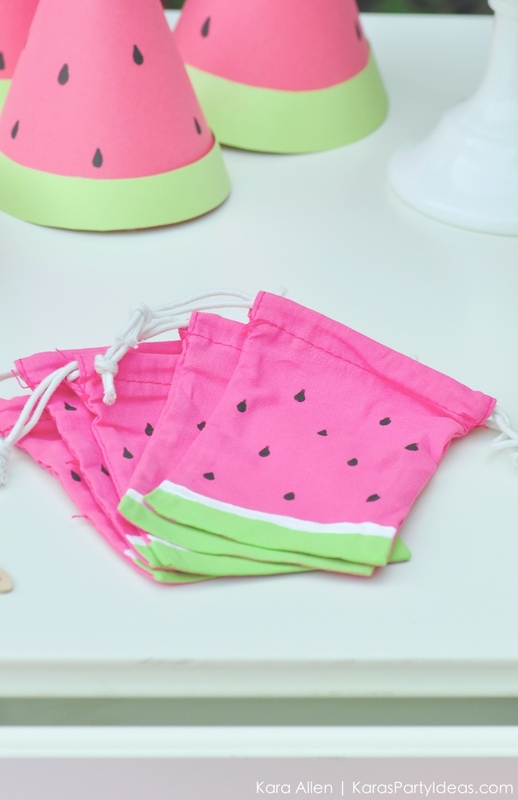 I mean, what says summer more than backyard parties and fresh watermelon?! 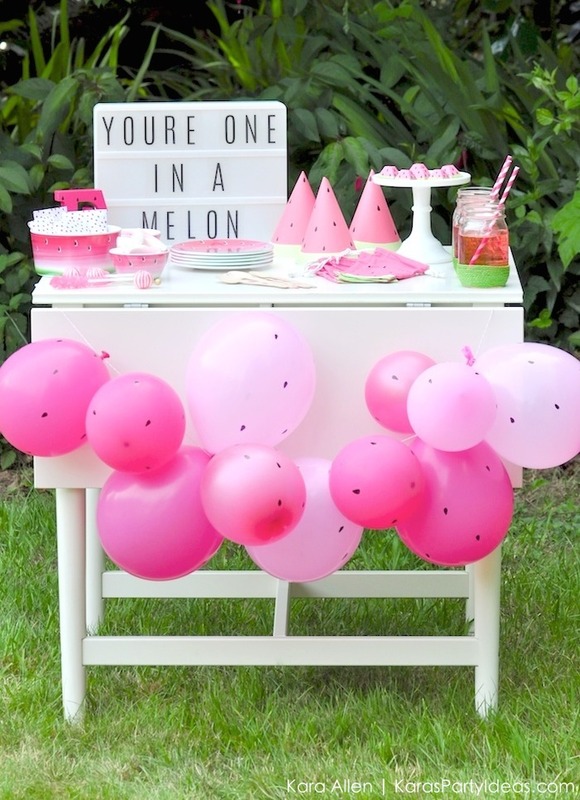 But it doesn’t end here…be sure to check out all of the other Michaels Makers DIY summer party ideas on the Michaels blog! 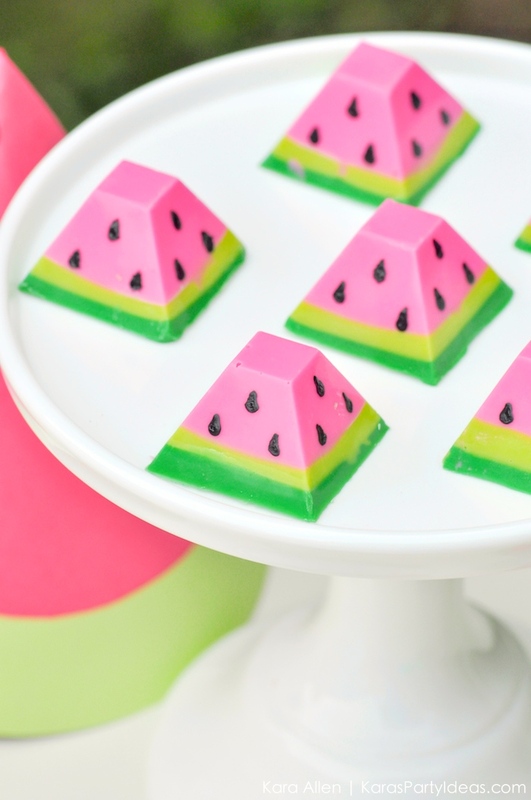 I made the above watermelon chocolate candies with Wilton Candy Melts, a chocolate candy mold, and an edible black food marker. 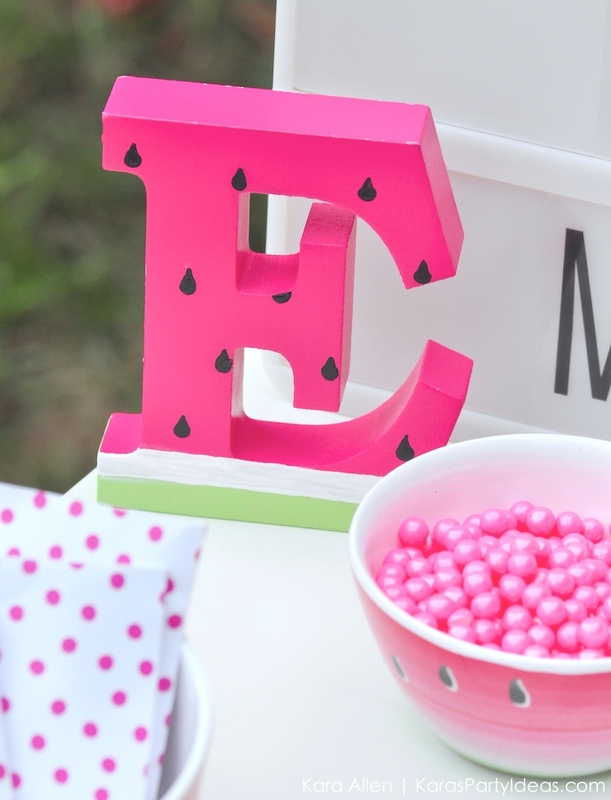 I purchased a wooden letter E from Michaels (The birthday girl’s first initial) and painted it to look like a watermelon! 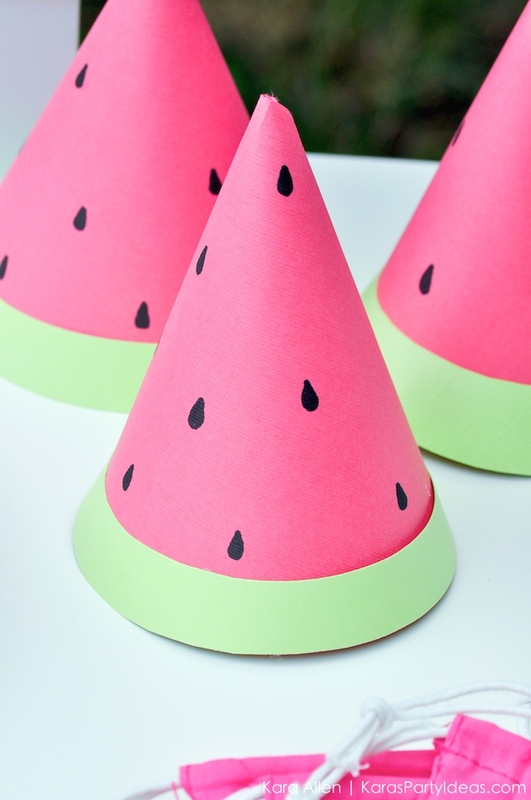 I made the above DIY watermelon party hats out of pink and green scrapbooking paper! 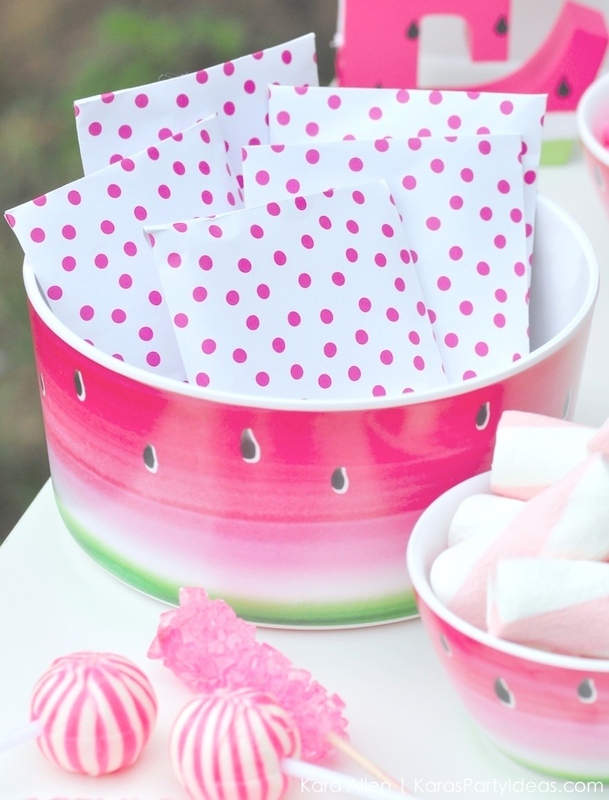 Follow my easy tutorial at the bottom of this post to find out how to make these DIY watermelon party favor bags! 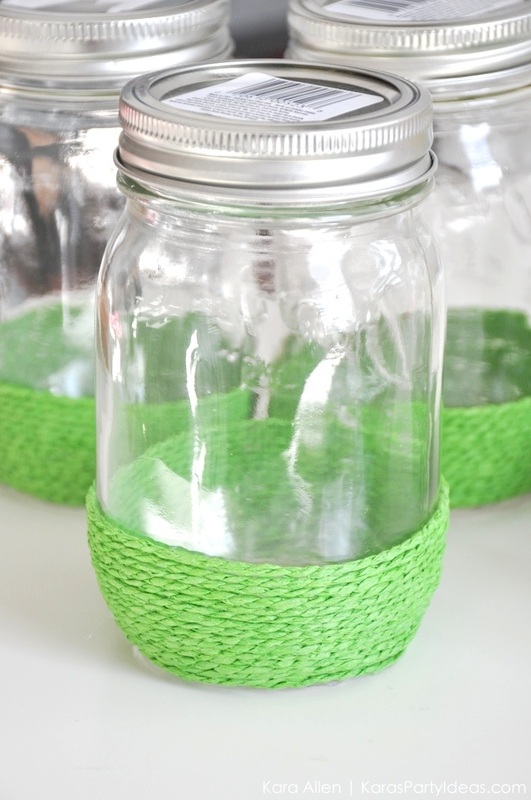 Make these super adorable watermelon mason jar drinking glasses with mason jars, green twine, and black paint! Simply wrap the bottoms of the jars with green twine, adhering the twine to the back of the jars with hot glue (I purchased my green twine at Michaels). 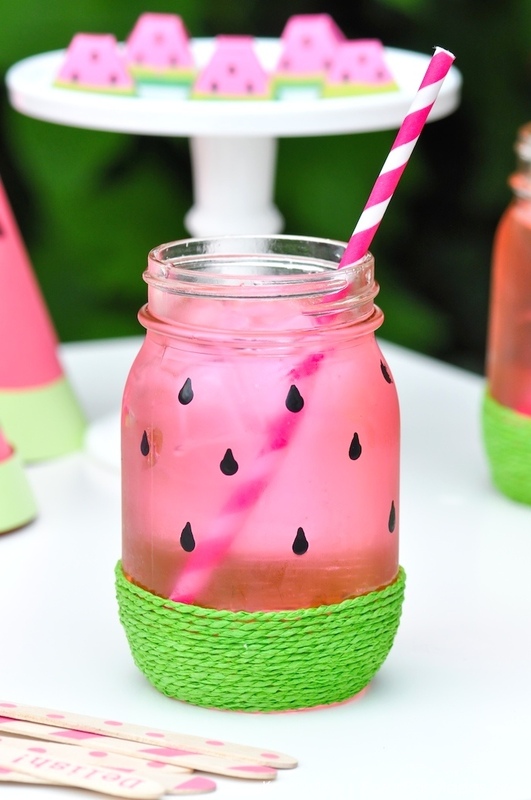 Then paint or draw black seeds onto the jars and fill the glasses with a pink drink! 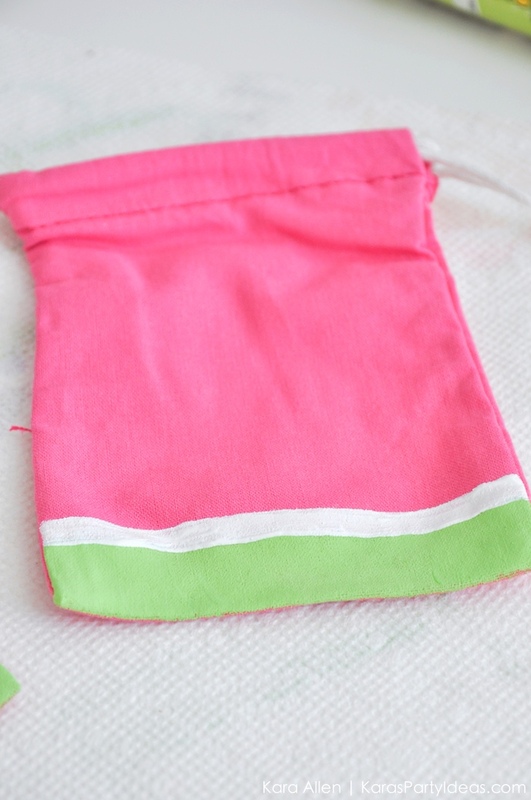 Step one: Using green and white craft paint, paint a green and white stripe at the bottom of your pink fabric favor bags (the pink favor bags are from Michaels). 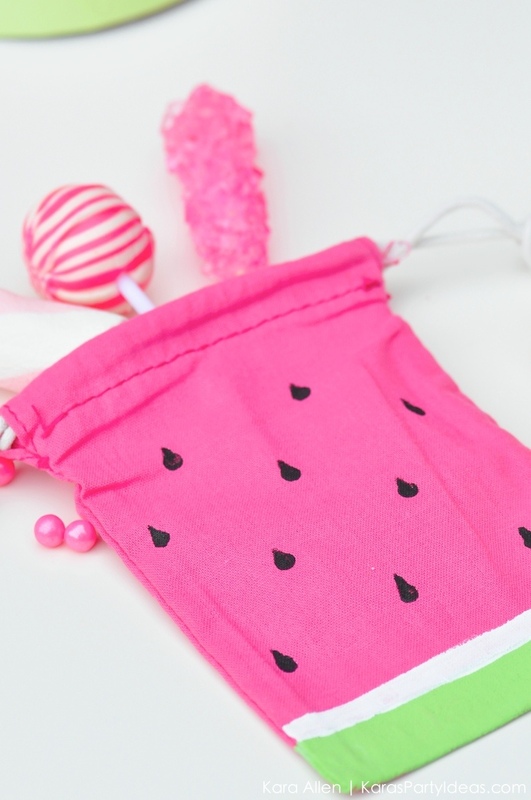 Step two: Using a tiny paint brush and black craft paint, paint small dots onto the pink part of the bag. Step three: immediately after painting the small black circles onto your bag, take a small pin or needle and pull the paint in an upward motion to create a tear drop shape. 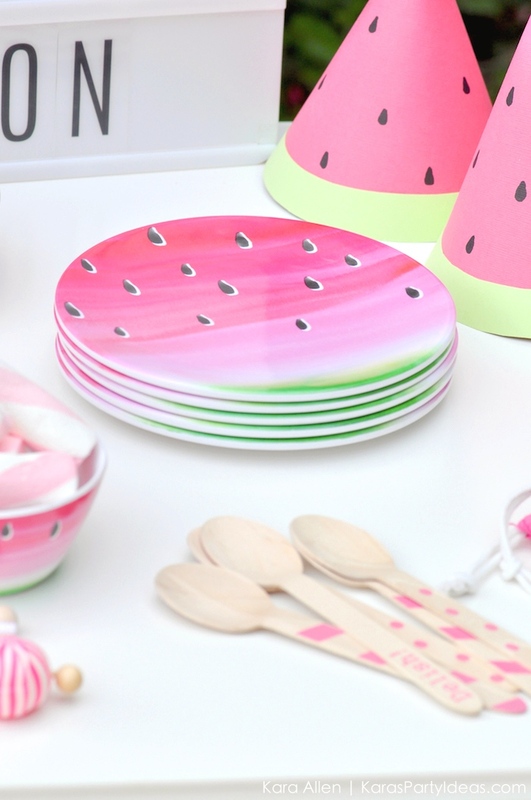 Don’t miss the rest of the Michaels Makers summer celebrations! 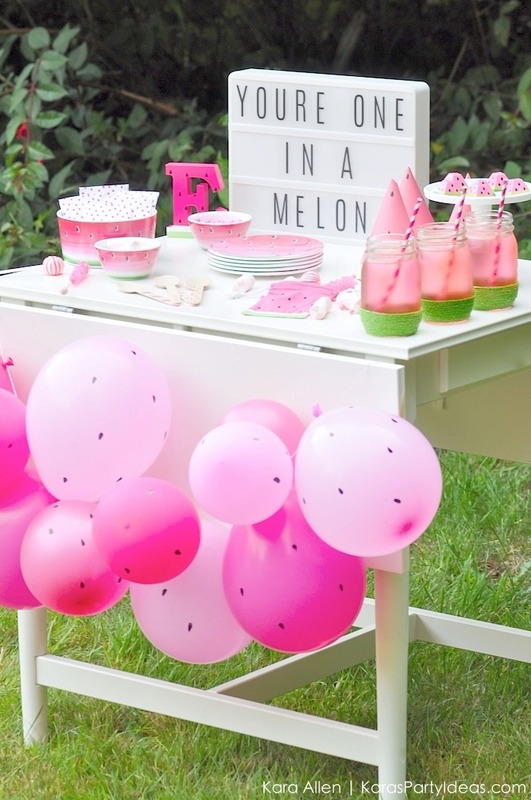 Check out all of the amazing party ideas below! 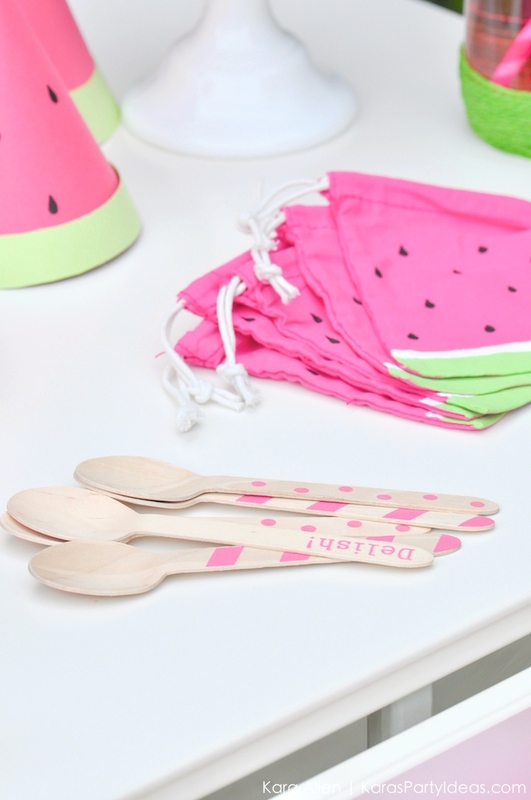 I hope you enjoyed this Summer Watermelon DIY Birthday Party! 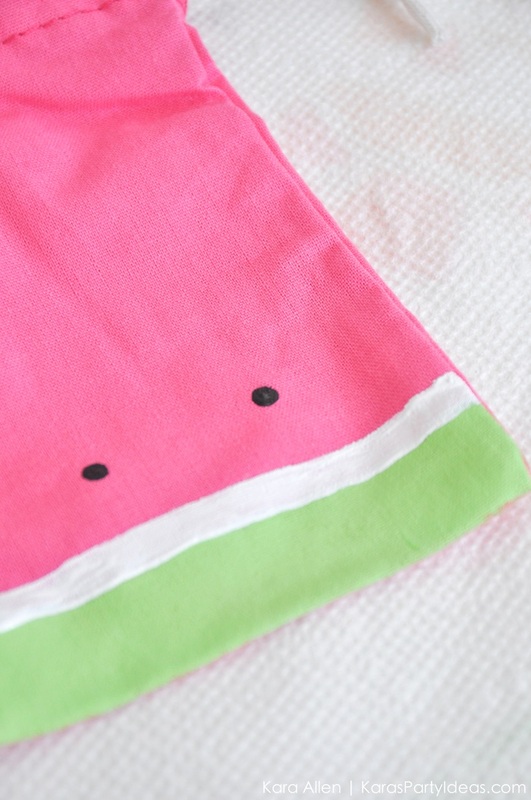 This watermelon party is adorable!! This is too cute! Love this idea!! 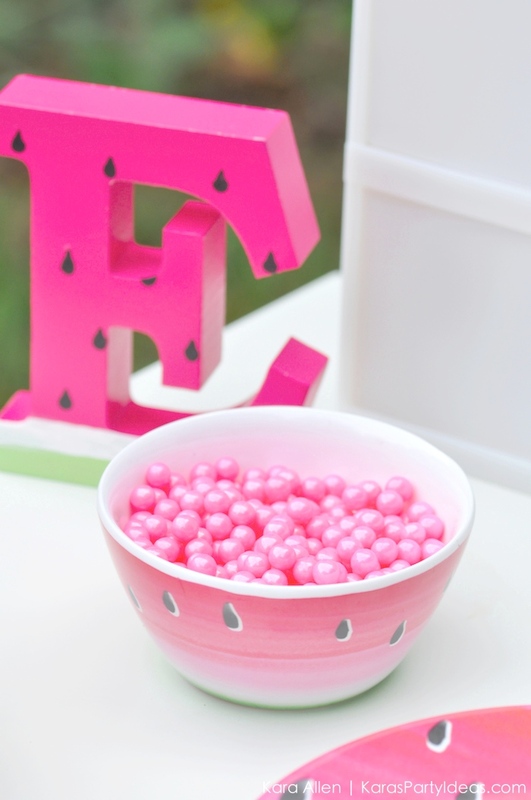 This is such an adorable party idea!! Love the favor bags and the mason jars!!! Awesome job!!! Hi ! Could you please tell me where you found the watermelon plates & bowls ? 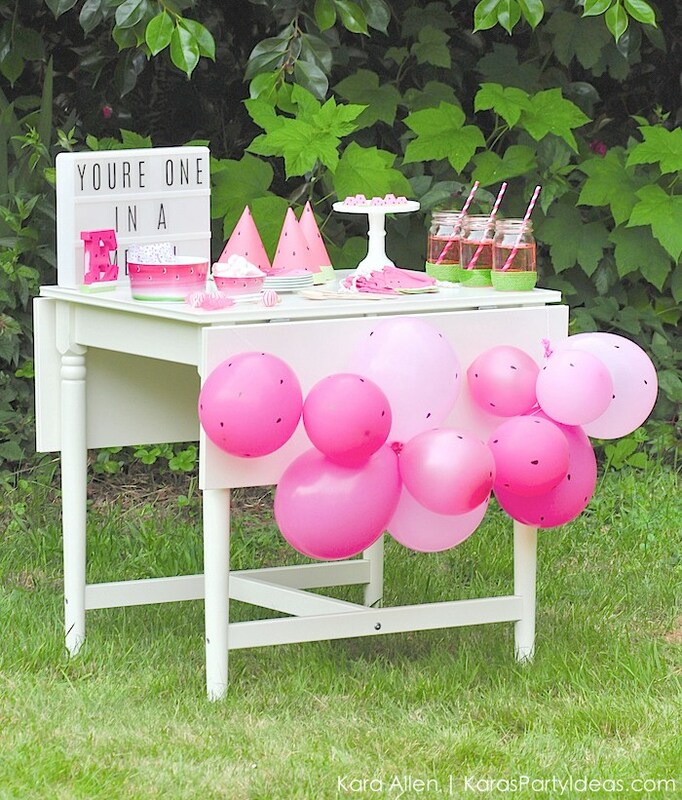 Thank you for sharing your party theme. 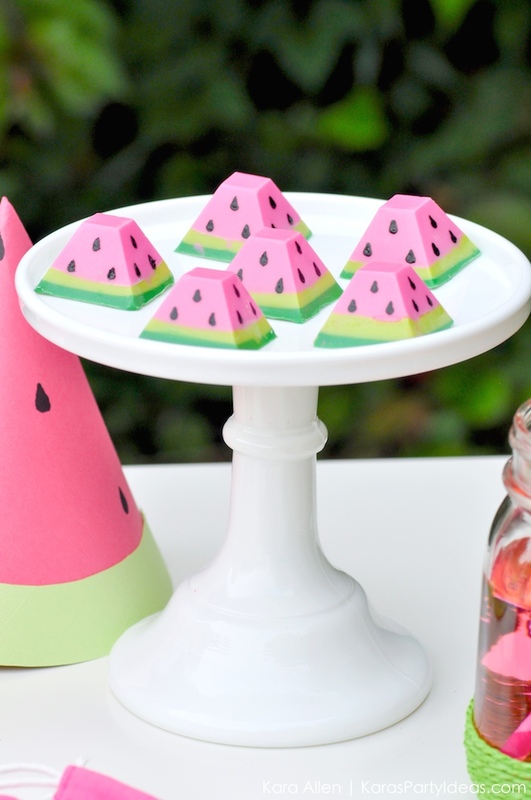 I think it’s a really good idea, but what kind of food would you serve with the party, besides watermelons and watermelon juice? 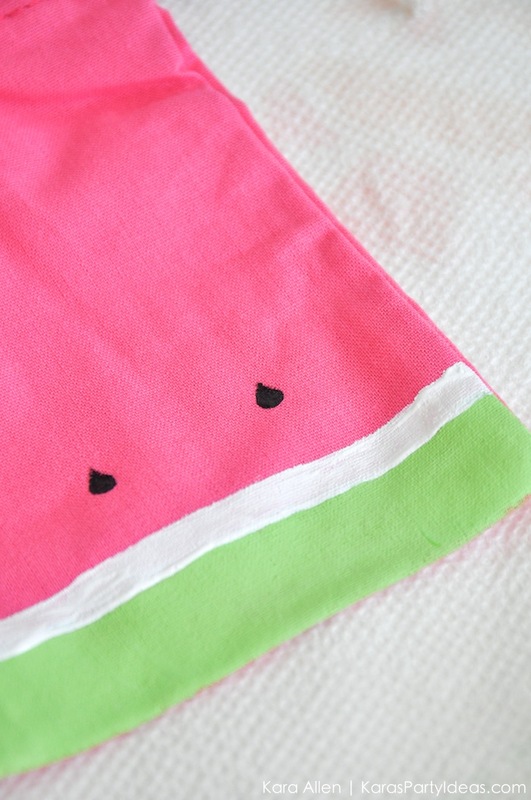 There aren’t very many recipes that call for watermelon as an ingredient at all, other than fruit salads or tarts. 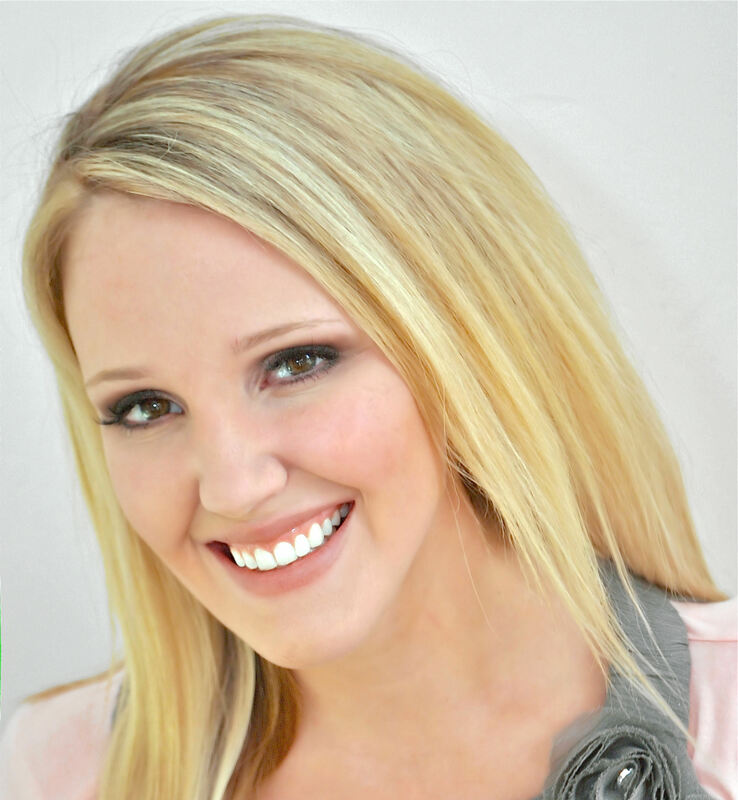 Hi Kristal, they are part of Kara’s huge collection of party supplies that she’s had for years. Sorry!! XOXO!! Please sign me up for your newsletter!!! I really love your page!!! 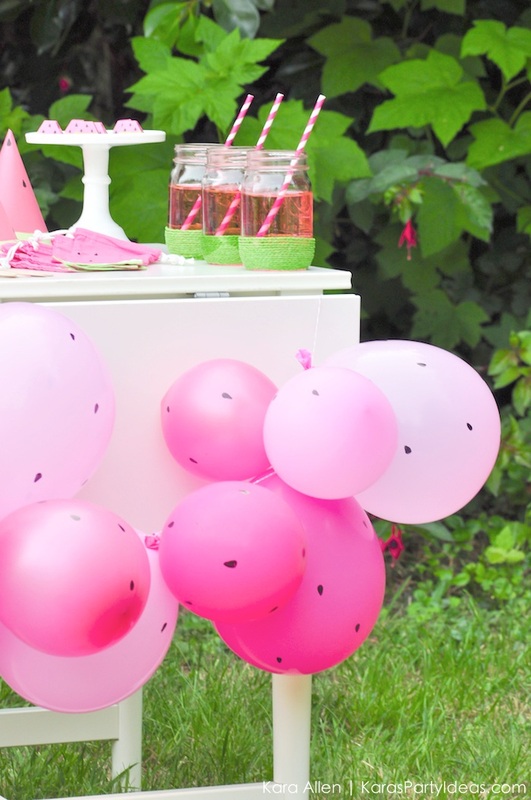 You have such delightful and wonderful Party Ideas, decorations and foods!!! Hi! I’m loving all your ideas here!! Question – did you add the spots on the balloons? If so, what did you use?? Thank you!